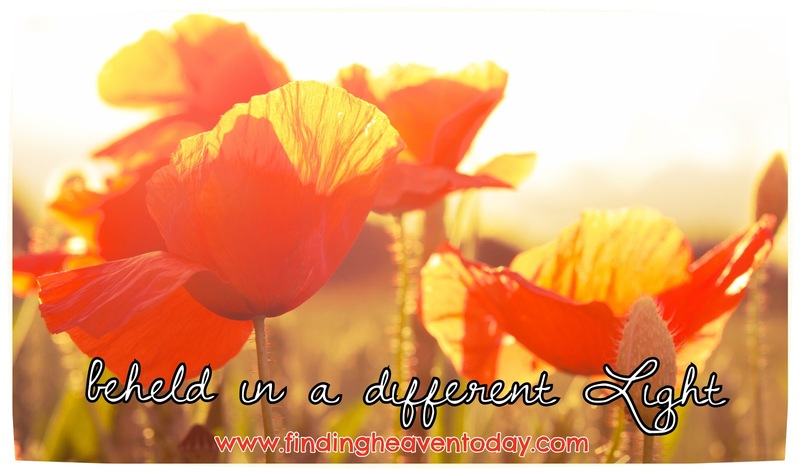 Finding Heaven: beheld in a different Light: Hello, Beautiful! beheld in a different Light: Hello, Beautiful! There is beauty everywhere, but so often we look through the eyes of the world, and we simply miss it...or maybe dismiss this beauty because it does not seem to hold up to the standards that our society has created. But what if we take the words of Romans 12: 1-2 seriously and we get serious about not conforming to the patterns of this world, but instead, we let our minds be transformed by the Spirit. What if we allow God to bend and mold us, what if we allow Him to touch our eyes so that we might see again in new light, what if we prepare our hearts to be astounded by what He has created? What if we become astounded by ourselves, not with a sense of selfish pride, but with heartbeats of gratitude? What if we let God's Word lavish our souls with wonder and amazement? What if we believe Him when He tells us that we are beautiful and that we are His? I’m not sure when it happened, or how exactly, but I can look in the mirror and see me and I’m okay with what I see. My soul began to believe them. Though I am a wear-makeup-every-day girl I had had dozens of visitors over the past several days and I hadn’t looked in a mirror. They were happy to see me – alive – and that was enough to make me feel gorgeous. We had been in a serious car accident. Miraculously, my children sustained only minor injuries and my husband had a broken ankle. I, on the other hand, left the accident by helicopter suffering multiple fractures in my left leg and a slew of internal injuries that filled my chest cavity with blood. My stomach had ended up where my left lung should have been. My lung sat up near my shoulder like a crumpled wad of Kleenex. So, the real reason I hadn’t seen my reflection was because I was bound to a bed, recovering. It didn’t take my caregivers long, however, to get me moving. Despite the two dozen staples holding me together from sternum to belly button, I was given a walker and taught how to hop on my one good leg with the walker’s support. Excruciating pain ricocheted through me as I raised myself upright and the blood rushed into my limbs. Could I really hop? Each day, each visit from my physical therapist, brought me a little further from my bed. Yes. I would walk again. Yes, I had to move, had to keep moving a bit more each day. I was saved but now must do the hard work of recovery. The day came when I could hop the three feet from my bed to the vanity area of my room in the trauma ward. I could brush my teeth, wash my hands and face with warm, running water and not just a washcloth. I could see my reflection in the mirror. With the audience of my therapy team and my nurse cheering me on, I took a deep breath and began. I had to stop twice and gather my strength, but I made it to the vanity and without looking up, turned on the water. I ran my hands under the warm, clear flow, filled open palms and splashed my face. I rubbed my cheeks and eyelids and simply felt the water. I dreamed a bit about the day I could shower again. I blotted my rejuvenated skin with a towel and looked at my reflection. And I agreed with everyone. I looked great. I looked alive. I was upright and breathing and grinning at myself. And from that moment on, I can look in the mirror and see me and I can accept my features, my lumpy tummy and my scars. And I don’t criticize. I give myself the grace I’d give anyone else who has birthed four children, lived over forty years, survived multiple trauma injuries and months of pain and restricted mobility. I give myself lots of grace. And I still wear makeup and do my hair. I exercise and I’m working hard to even out the landscape of my torso. But I do it all in grace. I move in gratitude that I have a life to live, a smile to share, legs that move me and walk strong again. Somehow, nearly dying taught me how to be happy to see myself. To be myself. And to reflect the beauty I’ve found in a life twice saved and eternally redeemed. Alyssa loves Jesus, her family, freedom, flowers, words, coffee, Ethiopia, and the scent of freshly turned earth in Spring. To read more of Alyssa's stories and writings, please visit her at Rocks.Roots.Wings. Linking today with Emily for Imperfect Prose. Wow--it kind of hurts just to read this. Thanks be to God for his protection over you. You are so right--grace is everywhere to be found. Thanks, Nancy. Yes, this entire situation, though more difficult than anything I've ever endured, has been incredibly graced. When my husband was in the hospital with his broken leg (and I was in ICU), asking God the usual whys and what-nows he was impressed with this answer: just let this bring me glory, tell my story and trust me to care for the details. So we made that our aim and our life has become a story of his power and grace. This was so beautiful, your words brought tears to my eyes. I am so glad you are here! God is using this to let His Spirit shine through you for all to see. You are an amazing woman friend! Ah, Shari - you feel this because you've been there, too, and you're blessing others through your struggle, too. Stay faithful! Alyssa, thank you for sharing your story! How true this is.... after spending most of last year fighting for my life, I can say that I see hidden beauty EVERYWHERE, not just in the mirror. I am thankful for the little things like being able to walk to the bathroom and brush my teeth in the morning... like being able to drive myself to work... like being able to go to work at all. Yes, there is beauty. And, I am thankful that I am here to enjoy it. Thank you for this post. I touched me deeply. I can just see you in the mirror, wrapped in the glow of life. I think miracles have a way of transforming our heart and EYES. I am grateful, not only that you are alive, but that you can see yourself as He sees you. oh Alyssa, I LOVE that you call yourself beautiful. And what an incredible story. You experienced your own sort of resurrection. wow thank you for this great post. It makes looking in the mirror and giving thanks a new perspective for me. Thanks for sharing such beautiful truths, learned despite hard times. Are you home now and continuing to be on the mend? Blessing on your sweet family. wow, what a powerful powerful story. And so sweet to hear the way you move toward healing and toward giving yourself grace. Thank you for letting us walk through this via your words. You encourage. what number has your number?